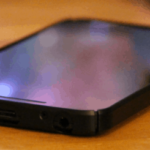 We’ve been using Ting for Kris’s phone the last 3 years, it’s been great (see my Ting Review)–but at our new house Sprint’s signal isn’t that good–it can’t really pull in a 3G signal consistently. In rural North Idaho the best coverage is indisputably Verizon, so I limited my search to Verizon MVNOs which have a BYOD (Bring Your Own Device) program and also only considered plans with access to LTE data. After doing some research and asking questions on HowardForums I finally settled on TracFone, which offers a great plan for light to moderate Android users. 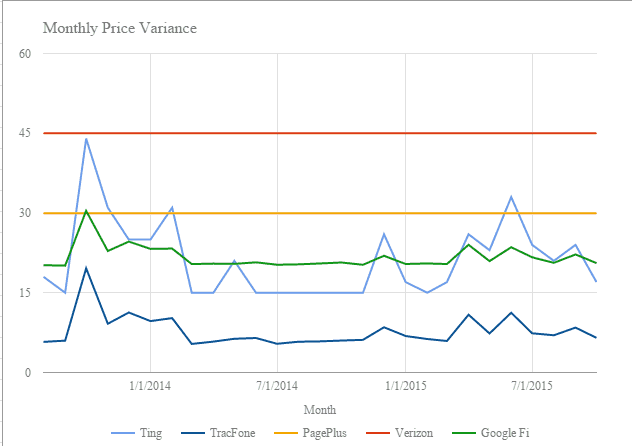 Looking at Kris’s past usage over the last 2 years TracFone (at today’s pricing) would have averaged $7.82/month! This is for a full SmartPhone service that includes voice, texts, MMS, and data on Verizon’s LTE network. If we use it more we pay more, if we use it less we pay less. TracFone is very confusing actually–the idea is you buy an airtime card or refill plan (25+ to choose from!) which gives you one or a combination of voice minutes, texts, megabytes, and service days. There are six types of cards you can buy–for the most part they provide the same service just with a different way and frequency of paying for them. Pay As You Go Cards. Provides 90 days of service. For SmartPhones the face value triples and you get an equal amount of minutes, megabytes, and texts just like the 1-year cards. Auto Refill. Provides 30 or 90 days of service. For SmartPhones the face value triples and you get an equal amount of minutes, texts, and megabytes like the 1-year and Pay As You Go cards. These can be set to auto-renew every 30 or 90 days. I should note that they won’t auto-renew when you run out of something. They just renew every x days. SmartPhone / BYOD cards. The face value does not triple on these cards. Provides 90 days of service along with the minutes, texts, and megabytes printed on the card. These cards are cheaper in terms of minutes and texts, but contain a little less data and only 90 service-days. Monthly Value. Same as auto refill but refills monthly instead of every 90 days…except for the 30 day auto-refill card. Data only, Text only, and Service only cards. Then there are individual bucket options–you can purchase data, texts, and also pay to extend service. The only bucket you can’t purchase by itself is voice minutes. Warning: I should also note, that some cards say “Double” but they are actually a worse deal. As far as I can tell the 1-year 800 double minute card doesn’t double or triple on a SmartPhone but it costs more than the 400 minute card! Also, bonus codes don’t work with SmartPhones–probably because tripling the value is already a great deal. Also, if you use the monthly-value or auto-refill I’d suggest buying a buffer of at least 30 days airtime in case the refill or renewal fails. 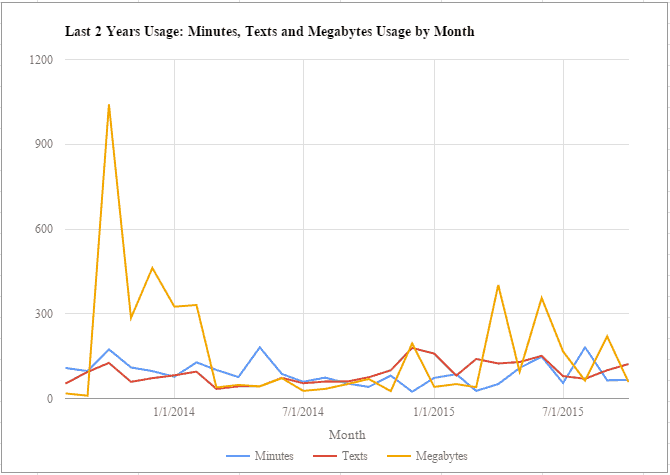 All of the buckets on the cards: minutes, texts, and megabytes never expire. They carry over and stack with each other. So if you buy two 90 day cards your service end date will get pushed out 180 days. One great thing about TracFone is if you don’t use up a the units in a bucket you get to keep it–essentially let it rollover forever as long as you don’t let the service lapse. You can build up your minutes, texts and data and keep them forever as long as you keep extending the service–which you can do by extending the service online for $50 to push the service end date out a year or by purchasing a card with service days on it. Surprisingly the larger cards aren’t always the most efficient. However, they /might/ be depending on your usage (see below). 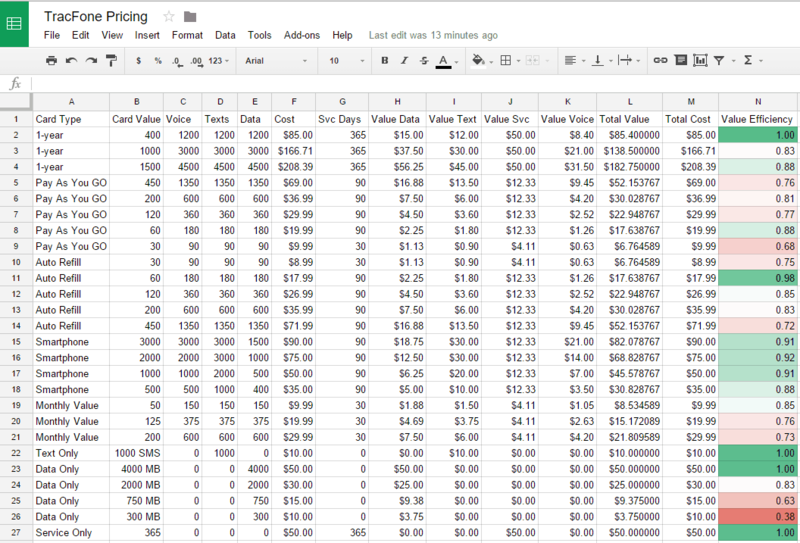 On the Value tab of the spreadsheet I also added a multiplier. The reason is some people may not ever use very much of a particular bucket so you can set that multiplier to zero to rank cards that favor that bucket lower on the Value Efficiency column. Likewise you may at times find yourself with an excess amount in a particular bucket. For example if your service-end date is 3 or 4 years into the future you don’t get much value purchasing service days so you can set the Service multiplier to 0 (or maybe 0.5 if you still want to give it some value) to lower the value efficiency of that bucket (which would make the SmartPhone plans or Pay As You Go more attractive than the 1-year plans). This is not an exact science, but close enough for me to help decide on which card to purchase. One thing I should note is if you buy the TracFone Cards through TracFone’s website you’ll also pay taxes, fees, and surcharges. If you’re in a high tax state You can save some money purchasing the airtime cards from other sellers such as Ebay (just make sure you use a reputable seller and complete the transaction through a safe method like PayPal). Some sellers on eBay will email a pin number to you within an hour of purchase. Okay… how is this better than a regular cell phone plan? Because, a regular cell phone plan is a “Use it or Lose it” model. You pay for a bucket of minutes, texts, and megabytes (sometimes for an unlimited bucket). In practice you have to choose a bucket based on your maximum usage in a month to avoid a service cutoff or overages. But anything you don’t use is lost. Generally for heavy users you’re better off with an expensive monthly plan, but for light users pay for what you use makes perfect sense. One thing to note is the peak data usage was just over 1GB, and data usage comes close to the 500MB threshold regularly enough that the minimum monthly use it or lost it plan we could comfortably get away with is one that provides 1GB of data. I looked at several wireless providers (also included Ting for Comparison). Ting (Sprint MVNO). Pay for the bucket you fall into. TracFone (Verizon/AT&T MVNO) – Prepaid with rollover. PagePlus (Verizon MVNO) – $29.95/month for 1GB data, 1500 minutes, unlimited texts. Verizon Prepaid – $45/month for 1GB data, unlimited minutes/texts. Project Fi (Sprint/T-Mobile MVNO) – $20 + $0.01/MB. Unlimited minutes/texts. 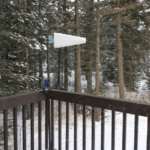 Fi would likely still have the same coverage issue at our house but it can also work on WiFi. 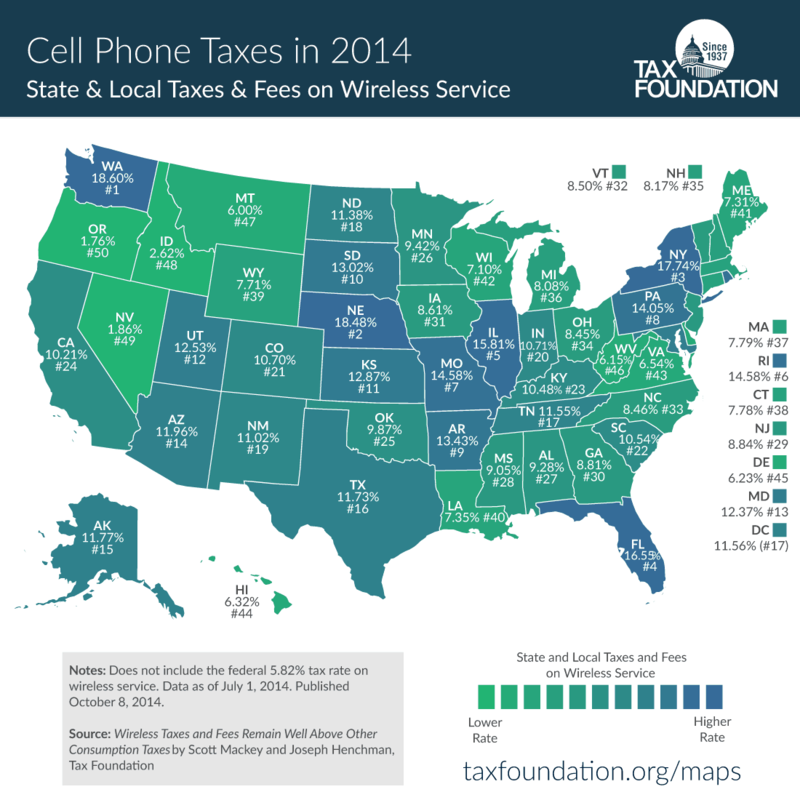 I excluded government cell phone fees and taxes, depending on the state you live in this can be a significant portion of the cost. Currently it is possible to purchase TracFone and PagePlus cards without having to pay taxes. With Ting, Project Fi, and Verizon Prepaid you won’t have an option to avoid the tax. 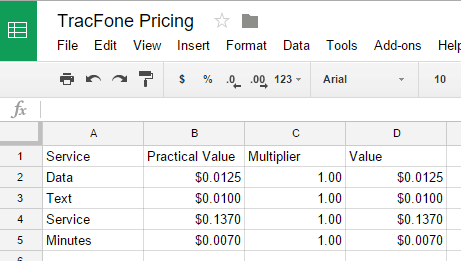 (Interesting to note how closely Ting and Project Fi are matched in price for one device. For multiple phones Ting would pull ahead). Also, I didn’t include the time-value of money. On a pre-paid service like TracFone you’re probably pre-paying anywhere from a few months to a few years in advance depending on how much buffer you want. However, the ROI is so quick (usually within 3-4 months) that the value lost pre-paying is trivial next to the cost savings. There is also additional risk with pre-paying–for example, if you for some reason need to cancel service with TracFone you’ll lose any airtime that’s been purchased in advance. Once again the ROI is fast enough I don’t think it’s an issue. 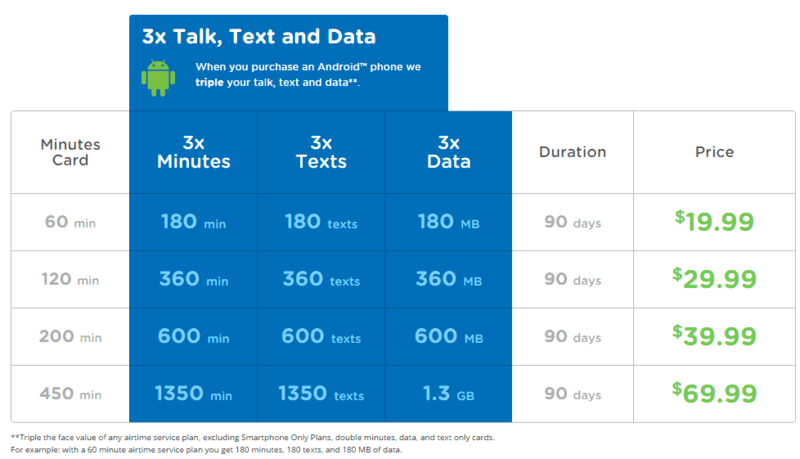 A light user that uses around 100MB, 100 minutes, and 100 texts / month will pay $85/year or $7.08/month on TracFone. 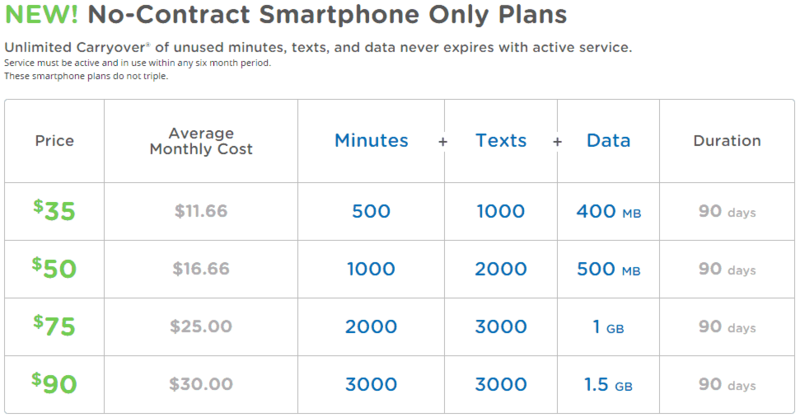 A moderate user averaging 600 minutes, texts, and MB will pay $290/year, or $24/month. When you start averaging above $30-40/month on a consistent bases is probably the point it would make more sense to switch to a Use it or lose it model like PagePlus, Red Pocket, or Selectel Wireless. It’s hard for me to see how people would use their phone that much though… 600 minutes is 10 hours on the phone every month! I’m not sure my ear would be able to handle that much talking. Certainly I can see using that much one or two months out of the year. And that’s a great usage scenario with TracFone–it doesn’t matter if you use up $80 worth of service in a month–what matters is your average usage over long periods of time. That’s where you will save over Use it or lose it plans. This seems to work fine. The Nexus 5X will Hotspot without checking for a subscription on TracFone (unlike Verizon UDP plans which charge an additional $20/month hotspot fee). 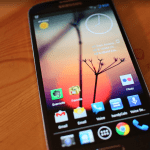 TracFone partners with several networks, including Verizon Wireless and AT&T. I opted to use Verizon’s network because of the better coverage in rural North Idaho. TracFone has a few limitations–it does not roam outside of Verizon’s network, and also there is no international roaming. 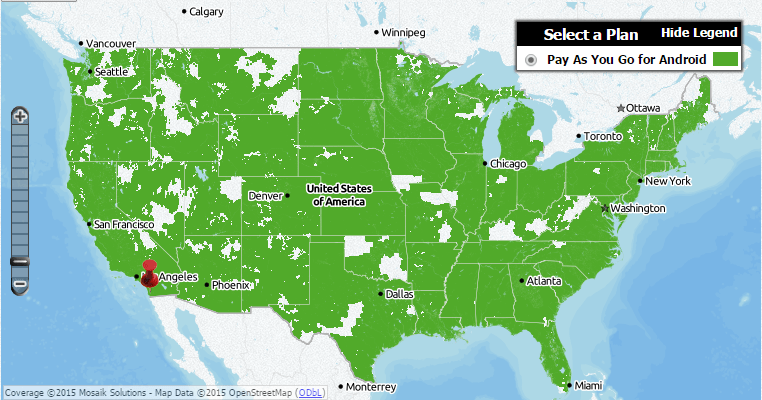 If you’re a frequent traveler outside the U.S. or in an area with poor Verizon coverage this wouldn’t work well. Voice / Texting / MMS / Data / Shortcode messaging. Voice, Texting, MMS, and Data all seem to work great. There is a feature called short-code messaging that TracFone does not support. I guess if you watch ridiculous shows on TV you can text to a number to vote or something of that nature. If you like to do that this isn’t for you. I don’t like normal voicemail, I prefer to have VM transcribed so I use Google Voice for this. Verizon’s Call Forwarding codes worked fine. *71yourgooglevoicenumber sets your phone up to forward to Google voice if you’re on the phone, reject a call, or don’t answer. This works as expected. The TracFone website is really not that great. It’s slow, you can’t do basic things like port a number in. And often when you try to do something it errors out. I had to engage support to port Kris’s number to TracFone since their website couldn’t do it. They have a chat support on their Facebook page (fortunately doesn’t require a Facebook login) or an 800 number. 800-367-7183. The chat often was down but I was always able to get help on the phone. One thing I do like about support is if they need to escalate to another person the original person stays on the line with you (at least that was the case for me). I found support pretty helpful but not as informative about the processes as they could have been. However, support was polite and always got things moving in the right direction. One thing support didn’t inform me of is when porting a number in to replace an existing TracFone number the airtime gets wiped out (I was suspicious that this may happen so I bought a very cheap airtime card to test with). After the port completed successfully the phone wasn’t working and support told me we needed to wait up to 48 hours—however it wasn’t working because of lack of airtime. My assessment of TracFone support is that if you need hand-holding or will get upset over a glitch this isn’t the best service. If you have patience you should be okay. TracFone has a great BYOP program. I activated with a Nexus 5X and it was simply a matter of activating with the instructions in the SIM card kit. It was up and running in minutes. The only reason I needed to involve support was I wanted to transfer Kris’s old number in. Carlos Slim owns a lot of pre-paid wireless MVNOs. One issue is all of them share the same database–so if you activate an ESN number on TracFone it will be impossible to move it over to some of the other Carlos Slim owned MVNO provider (if you should ever want to move in the future) because it gets locked to that MVNO in their system. However, because this is 4G LTE, the Sim Card will be used to activate the correct ESN on Verizon’s network, so if you have an old or broken Verizon Wireless phone you can provide TracFone that ESN instead of the ESN for your SmartPhone. You’ll want to buy or have a Verizon phone that will work. I bought the Nexus 5X (read my review of it here). 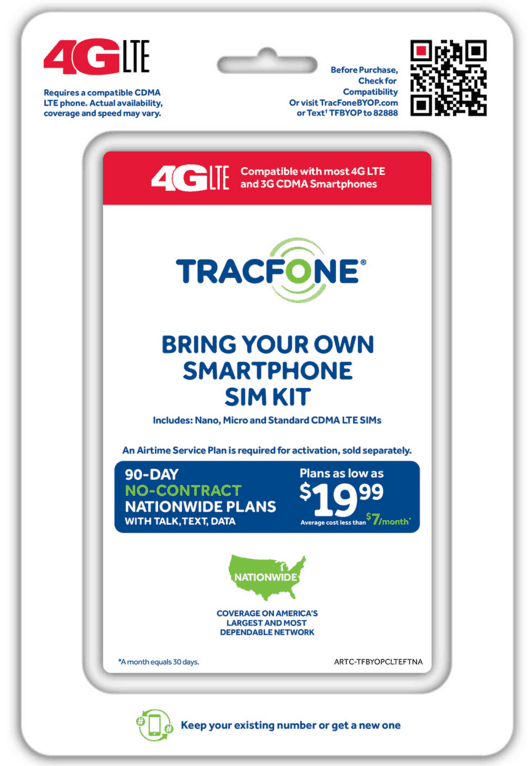 Second, pick up a TracFone 4G LTE CDMA Activation kit (the 4G LTE without CDMA activation kit is for AT&T’s network). You can buy it from TracFone or you may find it in a store like WalMart. I followed the instructions that came with the activation kit. You don’t want to run out of a bucket or that particular service will stop working. I really don’t want to babysit this, and I want plenty of units available in case they’re needed. So to get started I purchased a 400 minute 1-year card off Ebay. I setup a reminder to check the TracFone balance once a quarter (every 3 months) and if it falls below a certain threshold (say 800 minutes, 800 texts, and 1000MB) I’ll purchase the appropriate Airtime card to refill the balance and extend out the service-date. 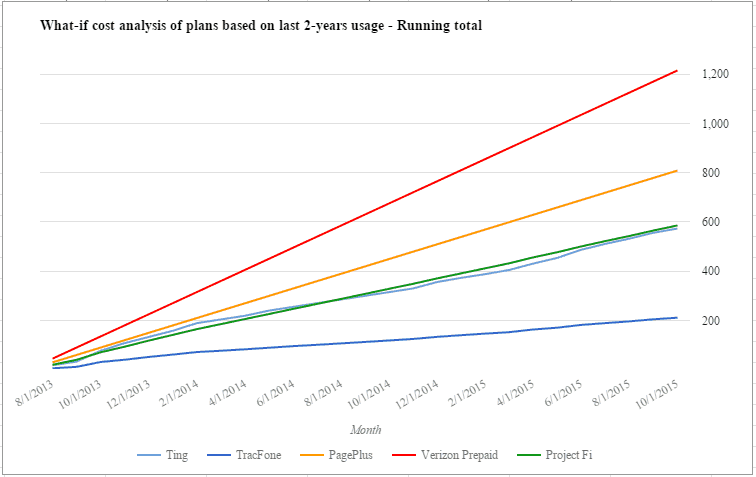 I don’t mind pre-paying years in advance–compared to a $30/month plan (which is really the next best price on a Verizon MVNO). Even paying a year in advance still has an ROI that beats the monthly use it or lose it plans at 3 months. TracFone is a very affordable service for light and even moderate SmartPhone users who have the patience to figure things out. Also, it’s easy to make mistakes on TracFone (like buying the 800 minute card that doesn’t triple)–if you’re the type to get angry over losing a few dollars over glitches and stupid policies this may not be the plan for you. TracFone users will also need the discipline to check on the account every quarter or so to make sure they have plenty of airtime and service left before reaching the expiration. If you can deal with TracFone the cost savings are well worth it. Consider a $60/month plan, a $30/month plan, and TracFone at $10/month. Look at it over a 2-year period. 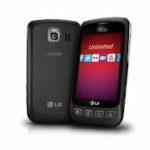 The first plan will run $1,440, the second $720, but with TracFone only $240! It’s hard to beat that pricing! With T-Mobile shaking up the wireless industry, Google Fi introducing a service that spans across multiple networks, and Ting offering great auto-adjusting bucket plan the wireless industry is finally starting to get competitive. For the consumers this is nothing but great news and I hope that we’ll see more improvement to infrastructure and pricing in 2016. Very interesting post — I’ve been wondering about prepaid vs postpaid and suspected that prepaid made a lot of sense. Keep T-Mobile (and Project FI) in mind. We recently switched to T-Mobile for smartphones and the coverage improvements even over the last few months have far surpassed my expectations (and I usually have high expectations on these kinds of things). You need LTE Band 12 capable device to benefit from the “extended range” they’ve been promoting. Also keep in mind that things get a LOT cheaper for the 2nd, 3rd, 4th phone on a plan with T-Mobile (and I assume most other providers). You can see what the coverage is like if you can get your hands on such a device and a prepaid sim to try. A few months ago, the fourth phone was basically free on a 10gb per phone plan with T-Mobile. Now it looks like you pay $80 for the first phone with 10gb, then add as many additional phones as you want each with 10gb for $20/ea. I’ve thought about adding phones just for the data since it works out to $2/gb but recently found unlimited deals on hotspots with AT&T ($65/mo) and Sprint ($45/mo) so I’m doing OK on data. You’re exactly right on your analysis on pre-paid vs post-paid. If you have one or two phones and varying or light usage then pre-paid tends to make more sense, but if you have multiple phones and more consistent or heavy usage post-paid starts to become more attractive. I’ve always liked T-Mobile, they seem to be a decent company with good customer service and lately they’ve really been investing in their network. 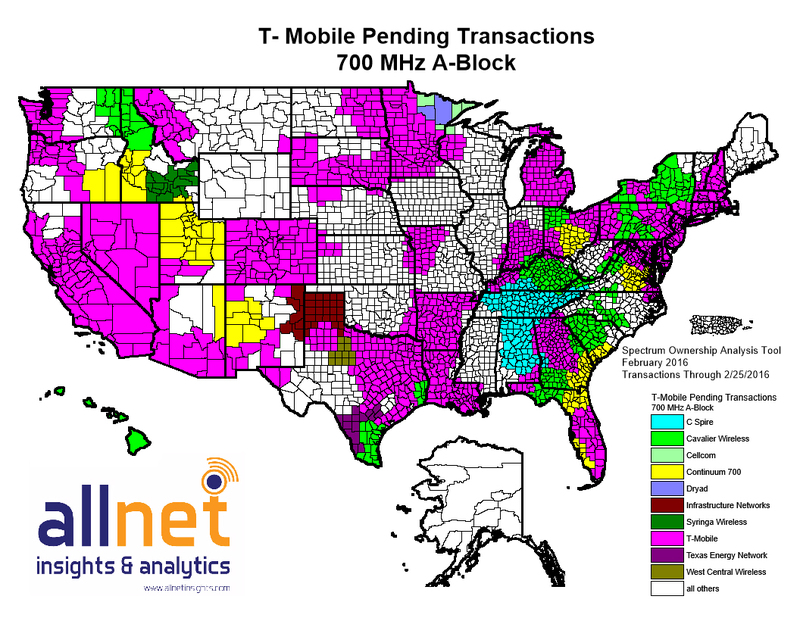 Unfortunately T-Mobile hasn’t deployed band-12 in my area (I think someone else owns the 700MHz frequency block here) so the only frequency they operate at is 1900MHz which doesn’t provide good coverage. It looks like T-Mobile has acquired it and the transfer is pending with the FCC! See the links below, especially the google map. It really is amazing how much they’ve been expanding and I fully believe the network will rank right up there with Verizon and AT&T soon… I’d say it is already getting really really close. Most of the time I don’t put much stock in the wild claims these companies make but in this case TMO is surpassing expectations. They’ve even been swapping spectrum with Verizon and others to make wide 700mhz coverage happen. That’s good news! Thank for the link.